I’m a big fan of the EA Access program, and in particular the way it lets you download trials of popular upcoming games early. In this way, I learned that I didn’t like Star Wars Battlefront without having to pay for it, and that Battlefield: Hardline was a lot more fun than the description made it sound. The latest game to get the Early Access treatment is the upcoming Need For Speed Payback, so being a massive driving game fan I dived straight in and downloaded it as fast as my internet would allow. Now, I’ve played every Need for Speed game since back in the days of the PS2, when Most Wanted was my favourite, right up to the travesty that was The Run. So how does the new one stack up, I hear you cry? Well, I’m glad asked! Here are my thoughts from the 10 hour free EA Access trial. First up and the characters this time around are a lot more likeable than those found in the last NFS game. There’s not so much of the “Dude! Bro!” dialogue to contend, which I personally am glad about as it just made me feel really old. The other big change this time is that you don’t play as only a faceless driver, you take it in turns of being one of three members of the same Crew. There’s Tyler Morgan, the leader and the self proclaimed best racer in the city. There’s also Jess, who seems to be adept at blocking and destroying the police, and finally Mac, who handles off road and drifting competitions. There’s also Rav, who is the mechanic and will happily sort the upgrades and tuning for the crew. It’s a departure for the series to not only have a black protagonist, but also a woman, and in the makeup of the crew there is a pleasing racial and gender balance, which is a step in the right direction. The best part is that it doesn’t feel like a box ticking exercise either, and the way the dialogue is written and delivered makes it believable that these people are friends, who happen to have different strengths and weaknesses. Don’t get me wrong, we’re not talking Shakespeare here, but it’s enough to make the game flow. The story sets up quite an epic arc of betrayal and revenge, with Tyler and co being double crossed by The House, a shadowy cartel who control the streets of the city, and try to decide who will win all the races and so on. The House are also branching out into property, and try to take the Casino belonging to Tyler’s boss. When Tyler decides to start disrupting The House, by joining a race and winning when he was told not to, The House takes revenge by <Spoiler> and so Tyler ends up in the desert, with no friends and far from home. Luckily, even though the double cross went down six months ago and he hasn’t spoken to Mac or Jess at all in that time, all it takes is a couple of phone calls and the band is back together. The story then revolves around the Outlaw Rush, a massive race in the city that if they can qualify and win, will somehow destroy The House. It isn’t really explained how these two things are intertwined, as The House seems to have more money than God, but we are assured this will be the case. So, in essence what we have to do is race and beat the local Crews in the desert, and luckily there is an off-road Crew, so Mac can come out to play, and also a tarmac crew, so Tyler can have a race. Jess seems to disappear at this point, but she does come back as we advance the story. The races are done in levels, so winning a race will unlock the next, also giving you the chance to upgrade your car to get competitive for the next one. Luckily, winning a race will not only grant you money and Rep (which returns from the last game – gaining Rep will allow your level to increase), but will also allow you to select one of three “Speed Cards”. These grant parts for the car that you are driving, like Turbo, Gearbox, nitrous and so on. They can be equipped immediately if they will be useful, but they can also be sold, traded in or sent to the Garage for application to a different car, maybe. Trading the cards is an interesting mechanic, as each you trade gives you a part of a card, and when you have three, you can swap them for a card of your choosing at the Tuning shops that are dotted around. When I say of your choice, you can pick the category of the card, but the perks on it will be random, but in my experience they are usually an upgrade. Just to bring in an extra level of complexity, the cards have manufacturers attached to them, and equipping three of the same will give extra bonuses. Luckily the visual side of the customisation hasn’t been forgotten, and every part of every car can be tweaked and changed. You do have to perform certain tasks to unlock some categories, like performing an 8 second drift, or reaching level five in Rep, and you also need to have the disposable income to change the parts. Once you meet the criteria, you can make your chosen car almost unrecognisable. I chose a Honda S2000 when I was offered the choice of my racing car; one wide arch kit and a sky blue respray later, it was looking like something that you’d only drive at night, with a bag on your head. Seriously, if I’d crashed this car into Halfords it would have come out looking better. With Macs ride I was a lot more restrained, simply painting a Subaru Impreza with a very fetching urban camouflage paint job. Ideal for in the desert, as I’m sure you can imagine! So, winning races leads to more races, and eventually a face off against the crew’s boss. If you can beat them, they will not only get you closer to the Outlaw race, but they will also reveal the location of a derelict car that you can claim. To rebuild a derelict, they will give a hand drawn map, that you have to match to the actual map of the terrain. Turn up at the correct place, and the game will guide you in by making a noise that gets louder as you get warmer. Finding the chassis then gives you four more parts you need to find, including the engine and the wheels. Once you have assembled a car, Rav can rebuild it, giving you a car that can be tuned higher than any of the regular ones. It works a lot like the barn finds from Forza Horizon, and this isn’t the only leaf that EA and Ghost have taken from the popular series’ playbook. Any car can go off-road and drive wherever you want it to go, but in a nice touch, Tyler’s cars feel out of their depth if you ask them to drive over the open desert, squirming and sliding as they struggle for grip. Mac’s on the other hand handles the rough stuff a lot better but can find themselves being left behind on the tarmac, so it’s very much horses (or horsepower) for courses. The free roam element of the game is also crammed with things to do, from smashing billboards to challenging roaming racers to contests, so there’s always a lot to do. Graphically and all looks very good, the car models are fantastic, the desert scenery looks awesome and the draw distances are easily on a par with Forza Horizon. If you can see something in the distance, you can drive to it, and the feeling of freedom is very refreshing. The particle effects, dust, and tyre smoke all look great too, with the engine sounds exactly as you would hope. The music is still very “yoof” and I can safely say that I didn’t know a single one of the song titles that came up on the screen, but then I am very old, so it’s to be expected. The only quibble I have with the visuals is that the characters look like Thunderbirds when they aren’t in the cars, with very peculiar walking animations, looking like they are on strings being manipulated by drunken puppeteers. Once they are in the cars and rolling however, all is well. Gameplay wise there is a pleasing mix of races to partake in – you can cruise around looking at the scenery, and the police sequences deliver a whiff of the glory days of Burnout, with cars being shunted off into the scenery, rolling and flipping, all in loving slow motion. Punting a house enforcer into an oncoming truck is always fun, and adds to the pure racing fun on offer. Add to this Daily Challenges that can be attempted to earn loot crates (in all but name), and there’s no lack of content to keep you going. So ten hours in to Need For Speed Payback, and I’m invested in the guys and their stories. 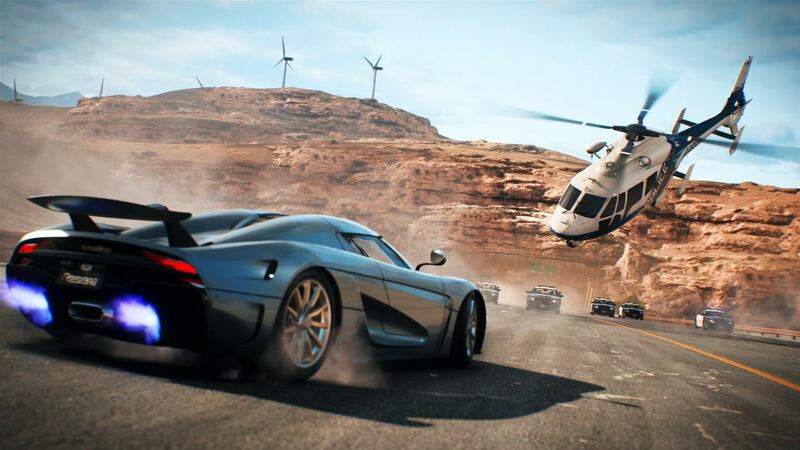 The trial comes to an end story wise after the mission that was shown off at E3, with the crew taking a Koenigsegg from the back of a truck. It’s a little disappointing to see the setup for microtransactions is already present and correct in the game, with consignments that can be earned in game or bought with real money, but I didn’t feel like I was missing anything by not having these items. There would seem to be an element of “Pay to Win” being introduced, as in-game cash can be used to buy speed cards at the Tuning Shops, but time will tell if this turns out to be an issue. All in all then, this is looking like a return to the good old days of Need For Speed, and I’m excited to carry on the story and take down the dastardly House. It’s time for Payback!